We offer many different curtain tracks, each with their own distinct strengths and uses. While we don’t have a “one size fits all” track in our arsenal, we do carry many tracks that have multiple uses and can be used in many environments. Among these is one of our bestsellers, the ball-bearing-carrier curtain track. This track is a strong, aluminum, architectural track available in white or silver that keeps a low profile once installed. It can be mounted on the ceiling or the wall, and parallel tracks can be installed in the ceiling, or on the wall via a double wall bracket. This track uses (surprise!) ball bearing carriers. 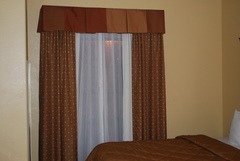 These little gems are smooth, quiet, and durable, which is why they are a popular choice for home/bedroom curtains. The parallel mounting capability on both wall and ceiling make this track a great fit for spaces with sliding glass doors or floor-to-ceiling windows, or anywhere you might want a sheer and a heavy drape. And, of course, a single, ceiling-mounted ball-bearing-carrier curtain track with a heavy drape can create a virtual wall, virtually anywhere. We would be happy to talk to you at length about everything you can do with a ball-bearing-carrier curtain track. Give us a call at 888-434-7444.